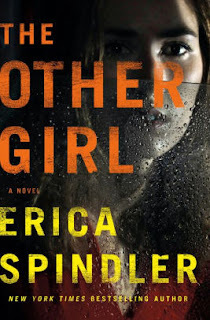 The Other Girl by Erica Spindler is a recommended police procedural. Officer Miranda Rader of the Harmony, Louisiana PD is called in to investigate the brutal murder of popular English professor Richard Stark, son of the powerful university president in this small town. The murder has every indication that it was one of great anger and planning. While Miranda is now a successful, respected police officer, she has a past. When a newspaper clipping from her past is found at the scene along with her fingerprints, it seems that someone is trying to set Miranda up, but why? The clipping is from 2002 when she was a teen. At that time she was known as Randi, and she was from the wrong side of the tracks. After an assault that was never confirmed and an arrest for possession, she spends some time in juvie. This was the impetus that propelled Miranda to turn the direction of her life around. Now someone is trying to set her up. But the case is more complicated than that because Miranda realizes that the victim was also a sexual predator and has likely been abusing woman for years. To complicate matters even more, now is the time her partner, Jake, decides to confess his love for her. The Other Girl starts off strong with Randi's misguided actions in 2002 and the present day brutal murder of a man who has a hidden past. Chapters continue to jump between the past and present to explain the connection. The novel, however, soon veers off course and becomes a mash-up of subplots. If you want a little romance with your police procedural and don't care about surprising evidence being uncovered or a shocking conclusion, this is a well-written book. Yes, it relies heavily on several tried and true plot devices and stereotypes, but it flows smoothly and is a quick read. Spindler brings it all to a conclusion. There were problems that made me feel The Other Girl is just an average mystery. The fingerprints at the scene, the chief questioning her integrity, the chief's cowering before the university president, combined with her personal life, the sudden romance, the estranged family, etc. (there are more issues) all resulted in the feeling that generic subplots were all mashed together in this one novel. This culminated in more than a few eye-rolls. The whole romance portion could have (and should have) been left out. The idea that Miranda is a smart, intuitive investigator never makes sense because she's not approaching everything in an intelligent manner. Spindler has written better novels, so, for me, this is a good airplane book. It'll help pass the time.